towards the +40mW total of 532nm. 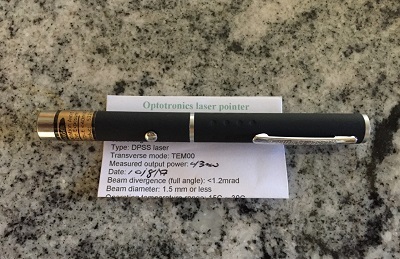 I purchased the 40mW Premium Green Pointer last week, at a cost of $80.00USD. For the quality of the laser, I can honestly say that I expected a lot more money out of my pocket, but, that is simply not the case! The quality, the craftsmanship, the reliability of the laser, everything is amazing, and, everything I would expect in a premium advertised product. This is my first >5mW green laser and I'm very impressed! Great quality laser, good service and fast delivery! Sure I'm going to talk of your products to mine friends and relatives! In the future, if I'll have to buy a new laser, I will do business with you again surely! PS: The only one little bad thing is the case, because it doesn't have a clip to maintain it close...but this isn't a big problem!! I've had this laser for about a week and I honestly have no complaints about its performance. The beam is visible at night and even in dimly lit rooms. I highly recommend this laser: it's a good balance between having too much power that you can't use it recreationally and not being able to see the beam very well. However, the laser came in a very cheap box with slots for batteries but no batteries, but I don't even care when I use the laser because the laser itself is quality. Also, this site has great customer service.